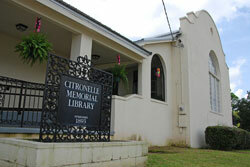 In addition to books, the library offers a video and audio library and six computers with access to the Internet. A copy machine is available. Black and white copies are 15 cents; computer printouts are 30 cents. In addition to books, the library offers a video and audio library and six computers with access to the Internet. A copy machine is available. Black and white copies are 15 cents; computer printouts are 30 cents.